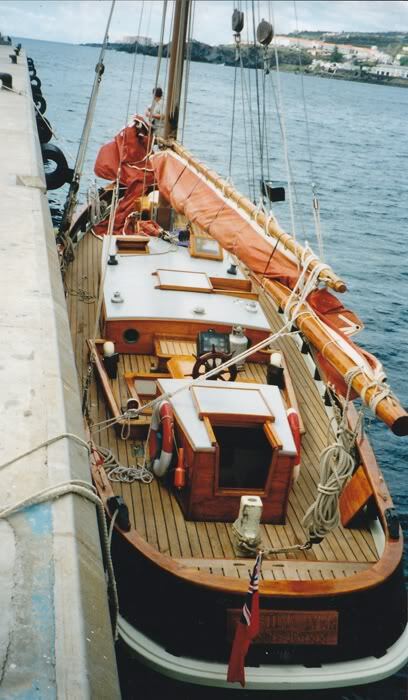 True's yard of her apart from one picture with one of the Buntings on board. In my notes on my family tree I have this boat as belonging to Charles " Chuck " Bunting. Ann" Nan" sent me a search ? about a boat that was giving cruises abroad but I couldn't make it work to look at it. I'm sure Star Lady must know. getting an email that say it was the Eric Brown I do not know what is what. Thanks for that simon its a great help. I do not know the exact dates but the Andre Germaine, which is the much photographed wreck at the entrance to the fishing fleet, was originally a French fishing vessel. It would have had a mast in the form of a cross, as the French fishermen were very superstitious. My ex, David Williamson, owned and fished with it at one point, probably in the 1980s. He sold it and either that owner or the subsequent owner removed the cross. Funnily enough after that the boat was beached at the entrance of the fishing fleet, where it still rests and rots! I don't know who finally owned it.